With only 300 units made, each watch is serialized. Uniquely for you. Seamlessly flanked by the crown guards, the crown stem is modified to fit the dateless design. Hade made in the USA, the straps are offered in a Horween Shell Cordovan leather and also an Italian vegetable-tanned calf. The dial features applied indices which are polished on the sides and painted on the tops. The skeletonized hands are color matched to the indicies. The Codek Spiral is a Swiss Made, 38mm automatic watch powered by a modified ETA 2824-2. 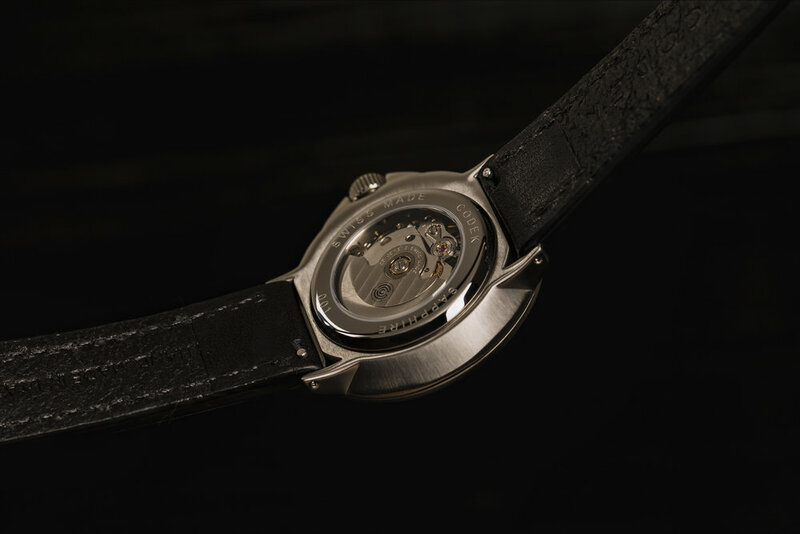 It's eye-catching design is inspired by the hairspring. 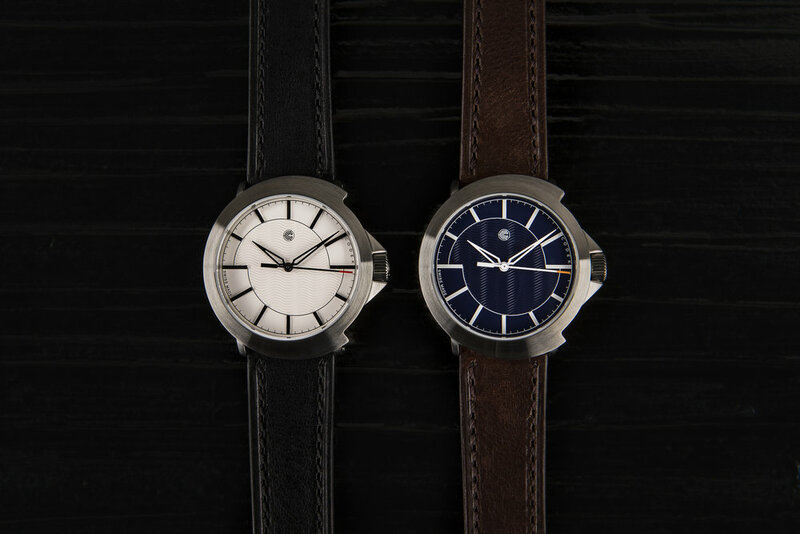 The 316L stainless steel case is beautifully proportioned at 38mm wide (excluding the crown) and 41mm lug-to-lug to look at home on almost any wrist. The non-circular case is complimented by the crown guards and the bowl-shaped profile reduces the caseback surface area for a more comfortable wearing experience. There are two dial variants: Midnight Blue with white indices and hands sporting an orange painted tip, and Opaline White with black indices and hands sporting a red painted tip. The contrasting light and dark colors make the watch extremely legible, while the painted tips add a subtle pop of color. The hour indices add playful tension because they do not conform to one standard length. The embossed waves shimmer in different lighting — at times blending into the background, and at other times forming the highlight of the dial. Design elements like these keep the watch fresh and visually interesting over time. Due to the dateless design, the crown stem is modified so that there is only one position. For a smooth feel, the crown is precisely measured to integrate seamlessly with the crown guards. The polished rehaut reflects the applied indices, which are painted on the top and polished on the sides to preserve legibility while maintaining a subtle sparkle. The skeletonized hands are color matched to the indices. These are just a few examples of how the fit, feel, and finish are rounded out on the Spiral. The reverse of the Spiral is equally attractive. It features a sapphire crystal display caseback encompassed with an engraved serial number. Peering through the glass is the engine of the spiral: the venerable ETA 2824 automatic movement. Each movement is tested and regulated in 3 positions by a watchmaker. The amplitude and beat error are also evaluated. On a full wind, the timing is expected to be well within -3/+6 sec/day. In French (the language used in early watchmaking,) "spiral" means hairspring — the component that inspired the design of the Codek Spiral. The hairspring not only keeps the time, but is also the metaphorical heartbeat and soul of every mechanical watch. The hairspring “breathes” as it expands and contracts to provide the restoring force to the balance wheel. The mechanical transfer of energy that starts from the mainspring, courses through the gear train, and terminates at the escapement. It is as if a small engine is ticking away on your wrist. In a time where battery powered quartz watches are prevalent, the smooth sweep of a seconds hand only serves to accentuate the allure of mechanical movements. The hairspring is a beacon for enthusiasts. The oscillation that happens 8 times per second is a tangible concept that enthusiasts can point to in order to explain why they enjoy mechanical watches. The intangible concept of time is given a physical form. The hour indices form a gradient arc from 9 to 3 o'clock and visa versa. This arc represents the expansion and contraction of the hairspring, which is the mechanical loss of power in exchange for the advancement of the seconds hand. The embossed waves on the dial represent the motion of the escapement. The amplitude of the hairspring and the five strikes between the impact pin, pallet fork, and escape wheel are represented through this detail. The crown and crown guards represent the stud, which acts as the anchor for the hairspring. The correct positioning of the stud is vital to assure that the rest of the hairspring and balance are positioned properly for efficient and accurate timekeeping. The case design is meant to evoke a balance wheel with three spokes. The balance wheel encapsulates / encases the hairspring, and it acts as a weight. Oscillating in unison, the hairspring and balance wheel act as the regulating organ for the watch. Limited run of 200 pieces in Midnight Blue. Use code “WINDUPSF” for $200 off. Limited run of 100 pieces in Opaline White.